After the Athenians beat the Persians in the First Persian War, at the battle of Marathon, the Persians left the Greeks alone for ten years. The Persians were busy fighting a revolt in Egypt, and their king Darius had died. But as soon as Darius’ son Xerxes (ZERK-sees) settled the Egyptian revolt, he began to plan how he would conquer those terrorists in Greece (remember they had burned the city of Sardis). 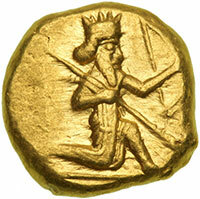 Since Darius’ plan to conquer Greece by sea hadn’t worked, Xerxes decided to try crossing over to Greece by land. He got together a big army from all over the Persian Empire, and they crossed the Hellespont on a pontoon bridge in 480 BC. 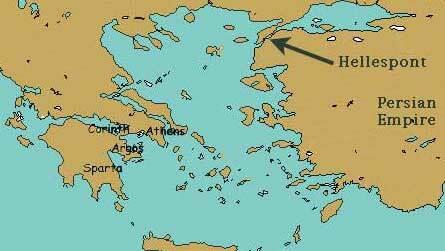 When the people of Thrace and Macedon heard that the Persian army had crossed the Hellespont and was coming towards them, they quickly surrendered to the Persians or made alliances with them. So the Persian army was able to march quickly west through Thrace and Macedonia. Then the Persian soldiers turned south towards Greece. They had to go through a steep mountain pass called Thermopylae (ther-MOP-uh-lay) (in Greek Thermopylae means hot springs, because there were hot springs there). There was no other way for an army to get south through the mountains into Greece, except through this narrow mountain pass. Cite this page: Carr, K.E. Second Persian War – ancient Greece. Quatr.us Study Guides, July 9, 2017. Web. April 22, 2019.